Hornady #3076 200 grain ELD-X was chosen to use in the Savage Model 110 chambered in 300 Winchester Magnum. The ELD is a long bullet (1.533) so when choosing load data care must be exercised because max loads for a Nosler Partition is not obtainable with the ELD line. To illustrate below is the data from Hodgdonreloading.com for Retumbo powder, where two loads are listed for 200 grain bullets, the Partition and the Accubond. The Accubond starts at 73.0 and max is 78.0 (also compressed) The Accubond is 1.490 inches in length, .043 inches shorter than the ELD-X. The testing on the ELD started with 73.0 and reached 76.0 grains. What was discovered is that at 73.0 grain velocity averaged 2685 fps with a spread of 32 fps and accuracy was consistent .75 inches at 100 yards. The charge of 75.0 grains averaged 2789 fps and 76.0 weight charged produced 2885 fps. Both heavier charges averaged spread of excess of 120 fps, the reason being a spike in the shot group, in both cases 3,000 fps was obtained. 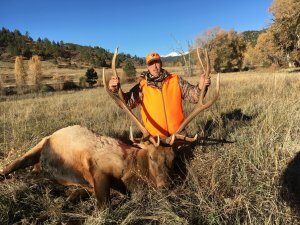 For the elk hunt accuracy was preferred over velocity so 73.0 grains was the charge weight, Prvi Partizan brass was selected (I like the close tolerance and longer life) and the primers are Federal #215. The rifle is zeroed at 200 yards.